Web, Cloud, Mobile & Embedded Solutions, Stockholm Sweden. Delivering consultancy services for more than two decades Nordforce has built up a track record ranging from one person assignments up to turnkey deliveries involving more than 10 man-year’s work. Our customers range from large telecom, power distribution and pharmaceutical companies down to small startups. Nordforce started as a one man company in 1992 with the company slogan “Quality in Practice”. The underlying ambition behind “Quality in Practice” was to really deliver what the customer needed and not only what was written in the requirement specification. Over the years the company has grown and the customer dedication has become an axiomatic part of our company culture. 2008 we started with the intention to take our company services to the next level based on the insight that the requirements of tomorrow’s products will be a lot tougher. The world is facing a growing population of elderly people and will place higher demands on every-day products and their usability. Also our earth’s limited resources set increased demands on better designed products from a resource point of view. In our latest projects we have expanded our network with a number of specialists to address these issues and to build up our competence. We are very proud for having implemented a customer product that will have a life span 5 times longer than competing products in the same niche. The product setup was also based on that the product should be able to be sent back to the supplier for refurbishing and reuse which is consistent with the emerging business concept “circular economy”. Our ambition is to have the knowledge and tools to help our customers to contribute to tomorrow’s society. We have a strong belief that future buyers and end users will increase their demand for products with a sustainable and user friendly design. Our ambition is to have the knowledge and tools to help our customers to contribute to tomorrow’s society with intelligent products with consideration taken to design and environment as well as business goals. In other words – Do Good Do Better. Our field of work ranges from programming Web, cloud, mobile and embedded solutions as well as hardware design for customers in medtech, telecom among others. We have the privilege to work with a well-established network of companies with cutting-edge expertise covering all the disciplines needed in a complete product development. This enables us to take full responsibility for a complete project from pre-study to CE-marked product in production. The challenge of each new assignment is to find out what is really unique and adapt to it. Once this is solved and you understand the underlying business that drive the product idea it is merely a question of executing the work in a professional and economic way. If you are going to build the right thing, the first step is to find out what are the real end user needs – today and tomorrow. In the early phases of a project we encourage our customers to spend quite some time sharing their business goals behind the project with us. In many cases we recommend the use of “system plays” in which an early mockup of the system is built and real users are invited to use the mockup as if they were in their daily work environment. Another useful tool is to make early inexpensive proof-of-concept prototypes. 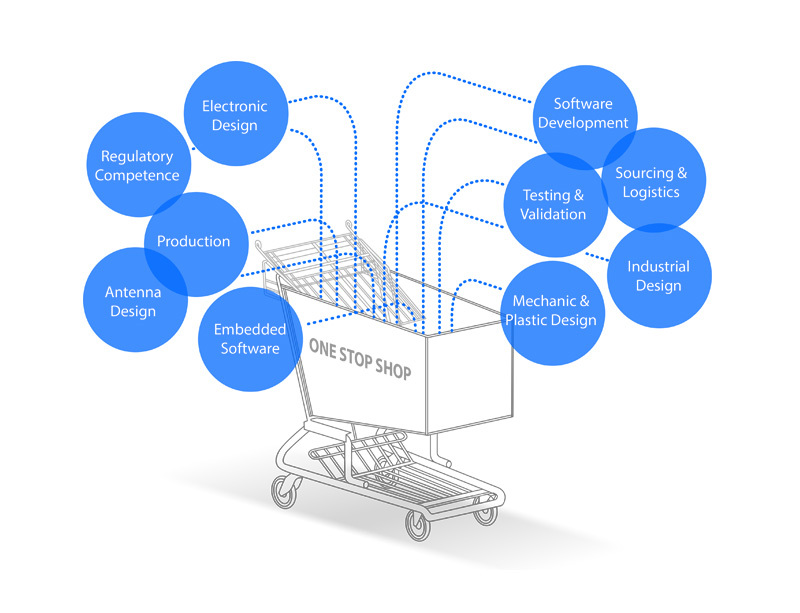 Nordforce has a documented agile development process targeting short time-to-market cycles while ensuring the conformity to applicable quality standards. The process encompasses all aspects of product development related to hardware and software with an interface towards a mechanic design process. A fundamental aspect of our process is that it may be adapted to the particular needs of the project e.g. a simple research prototype needs a far less rigorous approach than a life supporting medtech device. Most important is the transparency of the process. We always encourage our customers to follow the progress. Producing the product documentation is an integral part of the development process. Upon the completion of a project we compile the proper package of documentation including release notes, installation descriptions etc. Especially in projects relating to areas with rigorous regulatory requirements it is important for the success to start producing the documentation framework (technical file) early in the project. Have a look at some of our previous works and projects. Dentosystem Scandinavia AB has developed a new and patent pending method for early identification of individuals and individual teeth at greatest risk of developing periodontitis (tooth loss). Dentosystem needed a partner that could build this method into a complete web based software system enabling dentists and dental hygienists to predict patients’ risk of developing periodontitis. Nordforce was selected since we had the experience of building such complex systems with consideration taken to applicable standards for medical equipment. The challenge in this project was to handle a large amount of dental data and present it in a comprehensible way. ETM Communication AB supplies a generic M2M software platform to customers within smart meetering, forest industry, fuel and gas industry, field force management, asset management, security etc. Nordforce has been a long-term partner to ETMC providing turnkey solutions including operation, maintenance and end customer support. The system is built on modern Java based web technology. Main challenges have been to adapt to the vast requirements from different customer markets while maintaining a cohesive design. Also the system has to be scalable to cope with the enormous amount of data associated with M2M applications. Transferbio Information AB is a startup company within life science that supplies an innovative electronic data capture product for use in clinical trials and daily health care. The project was partially funded by Vinnova – Swedish Governmental Agency for Innovation Systems. Nordforce has had the complete responsibility for the entire product development from prestudy to CE marked product. The work has included server software, embedded software, hardware and industrial design as well as verification and validation. Main challenges have been to create a product that stretches the boundaries for usability of tools to collect data electronically from patients. To meet this challenge we took the pioneering approach to adopt the “design-for-all-test” methodology. Ericsson Nikola Tesla offers a remote health monitoring system. The systems measures body values like ECG, blood pressure etc. and transmits the data over mobile networks from patients to healthcare providers. The system is based on Bluetooth and GPRS/3G technology. Nordforce assignment was to develop hardware, plastics, advanced antenna design as well as embedded software and a Java-based back-end systems spread across three nodes. This project was challenging not only because of the spectrum of advanced technology combined with regulatory requirements but also because it was a multi-site project where the customers themselves developed the web interface in Croatia. Over the years Nordforce has contributed in several research projects with the purpose to facilitate the diagnosis of Parkinson disease by use of modern smartphone technology and the mobile network. Apart from developing suitable applications we have also hosted a number of clinical trials the longest of which lasted for 4,5 years. This assignment also included production, logistics and support. Since 2011 Nordforce is part of REMPARK, a pan-European project, with 11 participating entities including care givers, research centers, universities and SMEs. The goal of the REMPARK project is to develop a personal health system with closed loop detection, response and treatment capabilities for management of Parkinson’s disease patients. Our responsibilities in this project are the Bluetooth communication and regulatory compliance. The participating patients in clinical trials are sometimes asked to fill in a patient diary to keep track of their health, often using modern IT infrastructure. This is referred to as electronic patient reported outcome, e-PRO. Since year 2000 Nordforce has developed and operated a number of different e-PRO systems, based on various technologies such as Smartphones, SMS and Web. Our solutions have been used in in clinical trials in large parts of the world, and by some of the top 10 largest pharmaceutical companies in the world.The challenges in all these projects have been to obtain optimal usability and also to ensure that the patient data always is retrieved even when the communication network fails from time to time. Of paramount importance is the conformance with the rigorous Good Clinical Practice standard. I was very impressed that version 1.0 of such a complex system just worked – without any problems. I had never experienced anything like that before in my long career. I could always feel confident about the parts of the project that we ordered from Nordforce. They were always on top of everything. Nordforce not only developed a user friendly patient diary for our clinical trial, they also had the perseverance to keep the same high quality level in the operation and support of the system for more than four years. We at Nordforce are always looking for new talents. The button below will take you to our career site where you can view available job openings and learn more about what it´s like to work at Nordforce. Please feel free to contact us for additional information. Our office is situated in Midsommarkransen close to Stockholms city. A 30 minute drive from Arlanda Airport and 10 minutes by subway from Stockholm Cityterminal.